Most of the islands' native population (90–95%) died from European diseases carried by the Spaniards or married non-Chamorro settlers under Spanish rule. New settlers, primarily from the Philippines and the Caroline Islands, were brought to repopulate the islands. The Chamorro population gradually recovered, and Chamorro, Filipino, and Refaluwasch languages and other ethnic differences remain in the Marianas. The United States House of Representatives election in the Northern Mariana Islands, 2008 took place on November 4, 2008 and was the Northern Mariana Islands' first election of a delegate to the United States House of Representatives. Since the CNMI traditionally had general elections in odd-numbered years, the November 2008 ballot contained only this office. The Commonwealth of the Northern Mariana Islands was the last United States jurisdiction to receive congressional representation in the United States House of Representatives (in the form of a non-voting delegate).Gregorio Sablan, who ran as an independent, won the election and became the first Northern Mariana Islands Delegate in Congressional history. He assumed office in January 2009. The Northern Mariana Islands did not participate in the November 8, 2016 general election for President of the United States, because it is a territory and not a state. However, the five non-incorporated territories that send delegates to the House of Representatives participated in the presidential primaries of both major parties. In the presidential primaries, voters expressed their preferences for the Democratic and Republican parties' respective nominees for president. Registered members of each party only voted in their party's primary, while voters who were unaffiliated chose any one primary in which to vote. The caucuses were held in March 2016. The 2018 Northern Mariana Islands general election were held on Tuesday, November 13, 2018, corresponding with the 2018 United States midterm elections. Originally scheduled to take place on Tuesday, November 6, 2018, the elections were delayed by one week due to the impact and aftermath of Typhoon Yutu. Early voting was held from Tuesday, November 6th, until Monday, November 12, 2018. An estimated 18,975 voters were eligible to vote in the 2018 election.Ninety-seven candidates competed for 45 elected positions across the Northern Mariana Islands. High-profile races included the 2018 gubernatorial election between incumbent governor Ralph Torres, a Republican, and former governor Juan Babauta, as well as the race for non-voting delegate to the United States House of Representatives between incumbent Gregorio Sablan and challenger Angel Demapan. The 2018 Northern Mariana gubernatorial election took place on Tuesday, November 13, 2018, to elect the Governor of the Northern Mariana Islands and the Lieutenant Governor of the Northern Mariana Islands to a four-year term in office. The election, which corresponds to the larger Northern Mariana general election and the United States midterms, was originally scheduled to be held on Tuesday, November 6, 2018. However, Governor Ralph Torres postponed all elections in the territory until November 13 due to the impact of Typhoon Yutu, which struck the Northern Mariana Islands as a Category 5 storm in October 2018, shortly before the planned elections.Incumbent Republican Governor Ralph Torres, who became governor in December 2015 following the death in office of the late Governor Eloy Inos, sought election to a full term.Unlike past gubernatorial elections, there was no runoff election in 2018, since there are only two candidates contesting the gubernatorial contest, incumbent Ralph Torres and former Gov. Juan Babauta.On November 13, 2018, Governor Ralph Torres won his first full term as Governor of the Northern Mariana Islands. Arnold Indalecio Palacios (born August 22, 1955) is a Northern Mariana Islands politician and a member of the Republican Party, the 12th and current lieutenant governor of the Northern Mariana Islands since 2019. He previously represented Saipan in the Northern Mariana Islands Senate. Palacios is a former Speaker of the Northern Mariana Islands House of Representatives. He was sworn in on January 14, 2008, as the Speaker of the House's 16th Legislature. He represented Election District 3 in the House, which encompasses portions of Saipan and the Northern Islands.Palacios was the running mate of four-time gubernatorial candidate Heinz Hofschneider in the 2009 election. If elected, Palacios would have become the Lieutenant Governor of the Northern Mariana Islands in 2010. Instead, he was elected in 2018 with incumbent Governor Ralph Torres to begin a term in January 2019. Palacios is married to Wella Sablan Palacios and they have four children - Arnold Gerard, Nicole, Tiana and Eric. Palacios graduated from Portland State University. The District Court for the Northern Mariana Islands (in case citations, D. N. Mar. I.) is a federal territorial court whose jurisdiction comprises the United States-affiliated Commonwealth of the Northern Mariana Islands (CNMI). It was established by Act of Congress in 1977, pursuant to an international agreement between the United States and the CNMI that brought the CNMI under United States sovereignty. The court began hearing cases in January 1978. The court regularly sits in Saipan but may sit elsewhere in the CNMI. The court has the same jurisdiction as United States District Courts, including diversity jurisdiction and bankruptcy jurisdiction. However, the District Court is not actually a true (i.e., Article III) U.S. District Court, and because of that its judge is appointed for a 10-year term instead of for life. Appeals are taken to the Ninth Circuit. Like most federal judges, judges in this court are appointed by the President, subject to Senate confirmation. Judges may serve more than one term, subject to the standard nominating process. The United States is represented in civil and criminal litigation in the court by the United States Attorney's Office for the District of the Northern Mariana Islands. The first District Judge appointed was Alfred Laureta, who served from 1978 until 1988. His successor, Alex R. Munson, was nominated by President Ronald Reagan, and confirmed by the Senate in 1988. Munson was nominated for a second ten-year term by President Bill Clinton and was confirmed by the Senate in 1998. He took senior status effective February 28, 2010. On January 26, 2011, President Obama nominated Ramona Villagomez Manglona to be Judge for the District Court for the Northern Mariana Islands for a term of ten years. The U.S. Senate confirmed her nomination by voice vote on July 26, 2011 and she received her commission on July 29, 2011. Her term will end on July 28, 2021. The District Court for the Northern Mariana Islands was established by Pub. L. 95-157, 91 Stat. 1265 (Nov. 8, 1977), and is codified at 48 U.S.C. § 1821, a nonpositive law title. The Commonwealth of the Northern Mariana Islands Public School System operates public schools in the Northern Mariana Islands. The Commonwealth of the Northern Mariana Islands has a self-governing government consisting of a locally elected governor, Lieutenant Governor and the Northern Mariana Islands Commonwealth Legislature.Incumbent Governor Eloy S. Inos died on December 28, 2015 (local time in Seattle). According to Article III Section 7 of the Constitution of the Commonwealth of the Northern Mariana Islands, "In case of the removal, death, or resignation of the governor, the lieutenant governor shall become governor and the president of the senate shall become lieutenant governor." Lieutenant Governor Ralph Torres became the governor, and President of the Senate Victor B. Hocog became lieutenant governor on December 28, 2015. The following is a list of persons who served as Governor of the Northern Mariana Islands. The term of office is 4 years. The longest-serving governor in CNMI history is Pedro Tenorio, who served 12 years in office from 1982 to 1990 and again from 1998 to 2002. The music of the Northern Mariana Islands is dominated by the folk music of the Chamorros, which remains an important part of the islands' culture, though elements of music left by American, German, Spanish and Japanese colonizers are also in evidence. There are both Carolinian and Chamorro traditional chant styles. A variant of the Spanish cha-cha-chá is popular, as is a Carolinian "stick dance" which combines improvised percussion and foot stomping. A well-known stick dance group is the Talabwog Men Stick Dancers. The national anthem of the Northern Mariana Islands is "Gi Talo Gi Halom Tasi" (in Chamorro, "Satil Matawal Pacifico" in Carolinian), which was adopted on October 1996. The song's melody comes from a German tune, "Im Schoensten Wiesengrunde".Music festivals in the Northern Mariana Islands include the Fiestan Luta, an annual celebration. This is a list of the buildings, sites, districts, and objects listed on the National Register of Historic Places in the Northern Mariana Islands. There currently 37 listed sites spread across the four municipalities of the Northern Mariana Islands. There are no sites listed on any of the islands that make up the Northern Islands Municipality. 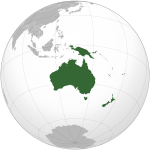 The Northern Mariana Islands Commonwealth Legislature is the territorial legislature of the U.S. commonwealth of the Northern Mariana Islands. The legislative branch of the territory is bicameral, consisting of a 20-member lower House of Representatives, and an upper house Senate with nine Senators. Representatives serve two-year terms and Senators serve four-year terms, both without term limits. The territorial legislature meets in the commonwealth capital of Saipan. Similar to the United States Congress, the Senate seats are divided into three districts (three seats each) whose boundaries are identical to those of the municipalities (except that the barely inhabited Northern Islands is incorporated with Saipan). The Constitution provides for the creation of a fourth district for the Northern Islands when the population exceeds 1,000. The Senate seats are divided into two classes, similar to the classes of Senators in the United States, with one class consisting of a single Senator from each district, and the second class consisting of two Senators from each district. In the first election after the ratification of the Constitution, the Senator with the third-highest number of votes held their seat for two years. Requirements for Senator are a minimum age of 25, residence in the Commonwealth for five years, and a registered voter in the district represented. The Constitution permits a higher residence requirement to be legislated. The House seats are elected from seven districts. Two districts have one seat each, one for Rota and Aguijan and the other for Tinian. The remaining five districts elect multiple members, three with two members, and two with six members, and are all located on Saipan, with one also including the Northern Islands. The Constitution provides for the Northern Islands to be a separate district when the population exceeds the number of people represented by any Representative. Reapportionment occurs every 10 years following the census. Requirements for Representative are a minimum age of 21, residence in the Commonwealth for three years, and a registered voter in the district represented. As with the Senate, the Constitution permits the Legislature to enact a higher residence requirement. The Legislature also has a youth congress, the Commonwealth of the Northern Mariana Islands Youth Congress. The Northern Mariana Islands House of Representatives is the lower house of the Northern Mariana Islands Commonwealth Legislature. District 7: Rota & Aguiguan (1 seat)In the November 2007 general election, which elected the 16th House, Republicans won a majority (12 seats) and took control of the House in January 2008. The is the upper house of the Northern Mariana Islands Commonwealth Legislature. The Senate consists of nine senators representing three senatorial districts (Saipan & the Northern Islands, Tinian & Aguijan, and Rota), each a multi-member constituency with three senators. In the November 2007 elections, the three senators up for re-election were all re-elected to another four-year term in the 16th and 17th Senate. The Covenant Party, which lost control of the House, entered into coalition with the Democrats and a lone Independent over the Senate's leadership and voting agenda. The CNMI Senate was controlled in 2016 by a Republican majority under Senate President Franciso Borja.Maria Frica Pangelinan was the first woman to serve in the Senate. The Supreme Court of the Commonwealth of the Northern Mariana Islands, 1 CMC § 3101, is the highest court of the United States Commonwealth of the Northern Mariana Islands (CNMI), exercising civil and criminal appellate jurisdiction over commonwealth law matters. It should not be confused with the District Court for the Northern Mariana Islands, which exercises jurisdiction over federal law. The Supreme Court sits in the capital, Saipan, and consists of a Chief Justice and two Associate Justices. The CNMI has no intermediate appellate commonwealth law court, which means that the CNMI Supreme Court hears appeals directly from the trial-level Superior Court. The Northern Mariana Islands national football team represents the Commonwealth of the Northern Mariana Islands in international men's football. The team is controlled by the governing body for football in the Northern Mariana Islands, the Northern Mariana Islands Football Association, which is a member of the East Asian Football Federation (EAFF) and an associate member of the Asian Football Confederation (AFC). The federation is not a member of the world governing body FIFA and so whilst the national team is eligible to enter AFC and EAFF-run competitions, they are currently ineligible for global competitions such as the FIFA World Cup and FIFA Confederations Cup. As such, they do not have an official FIFA ranking. However, the team have been consistently ranked as one of the worst teams in the world on the Elo ratings and are in fact, at July 2016 rated as the worst men's senior international team in the world in a ratings system that also includes a number of other non-FIFA teams. Following the completion of the preliminary qualifying round for the 2017 EAFF East Asian Cup the team have won only one official competitive match against international opposition and have a goal difference of −78 in official matches. The team have never qualified for the finals of a major tournament and beyond friendlies and qualifying matches, their only official competition has been in an exhibition tournament in the regional Micronesian Games in 1998, which they won, to date their only tournament success. They are one of the youngest international teams, having played their first match in an exhibition tournament associated with the 1998 Micronesian Games. Following this appearance, they played only one more match, against the Federated States of Micronesia before the original governing body for football in the country, the Northern Mariana Islands Soccer Federation, became defunct and the team withdrew from international competition. During the time of the Northern Mariana Islands Soccer Federation, eligibility criteria for the national team were quite lax, a minimum residency requirement of two years meant that the national team often included a number of contractors working on Saipan who were not of Northern Marianan heritage. Following the foundation of a new governing body, the Northern Mariana Islands Football Association, the national team was reestablished and, having resigned their associate membership of the Oceania Football Confederation (OFC), they joined the EAFF in 2006, becoming full members in 2008. Since that date, their international appearances have mainly been restricted to qualifying competitions for the EAFF East Asian Cup, although they also attempted to qualify for the AFC Challenge Cup once, having been admitted as associate members in 2009, and have played several friendly matches against neighboring nation Guam, in which the two countries compete for the perpetual trophy, the Marianas Cup. Competitive success has been hard to come by for the team, they had to wait until June 2010 to register their first draw under the auspices of the Northern Mariana Islands Football Association, a 1–1 draw in a Marianas Cup match against Guam. A further four years passed before their first victory, a shock 2–1 win against Macau in July 2014 in EAFF Cup qualifying. As of July 2016 the team have failed to win another competitive international. The CNMI Republican Party is a political party in the Northern Mariana Islands. The Northern Mariana Islands Republican Party is now associated with the United States Republican Party though no Northern Mariana Islands politicians have achieved high-ranking positions in the mainland United States. Saipan (, formerly in Spanish: Saipán) is the largest island of the Northern Mariana Islands, a commonwealth of the United States in the western Pacific Ocean. According to 2017 estimates by the United States Census Bureau, Saipan's population was 52,263. The United States congressional delegations from the Northern Mariana Islands consist of single Delegate elected at-large. The first non-voting delegate to the United States House of Representatives, Gregorio Sablan, was elected in 2008 and took office in 2009.